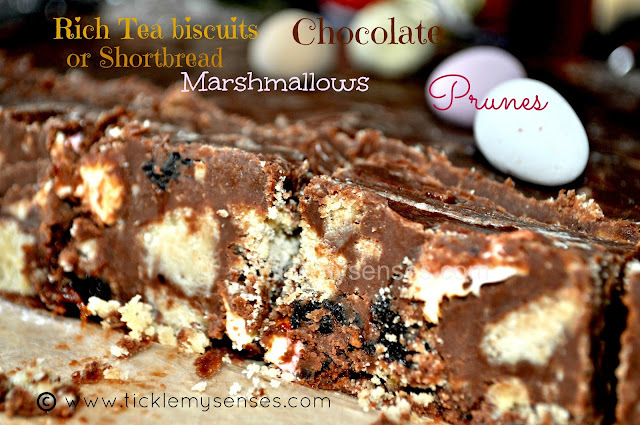 Tickle My Senses: 'No-Bake', 'Egg-Free' Chocolate Crunch Cake with Marshmallows, Prunes and Short Bread. 'No-Bake', 'Egg-Free' Chocolate Crunch Cake with Marshmallows, Prunes and Short Bread. 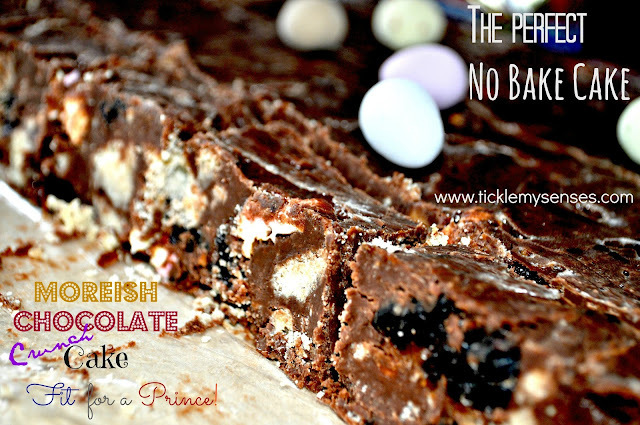 For 'Red Nose Day' (Comic Relief) at Baby A's nursery I made this simple, delicious, chocolatey, 'No bake' 'Egg Free' Chocolate Cake with Marshmallows, Prunes and Shortbread. It was relished by all, very moreish, and to- die-for. This cake also known as the 'Chocolate Biscuit Cake', 'Chocolate Fridge Cake' or 'Chocolate Crunch Cake' was a bit of an unknown cake right until 'Prince William' (the future King of England) claimed it to be one of his favourite desserts and even had it served to his guests at his Royal's wedding reception at Buckingham Palace in April 2011. 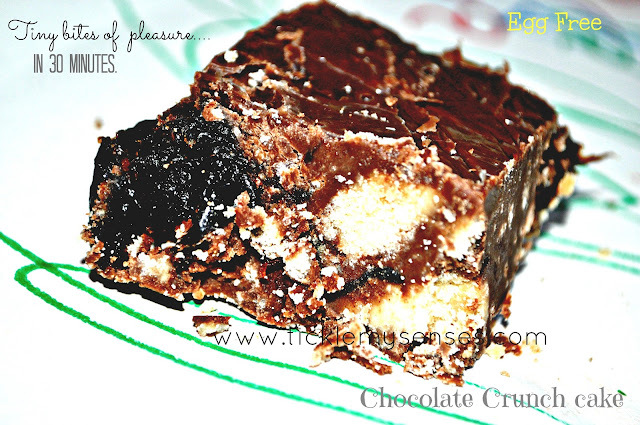 You could substitute the marshmallows and prunes with dried fruit and nuts of your choice. The Rich Tea Biscuits can be substituted with Short Bread or Marie Biscuits. I simply broke the biscuits into 1/4 inch pieces, mixed them up with chopped prunes and mini marshmallows, then incorporated these treats into melted chocolate, poured into a tin and let it sit for a few hours. Then chopped them into bars and stored in the fridge. To make No Bake Chocolate Crunch Cake with Marshmallows, Prunes and Short Bread/ Rich Tea Biscuits. Makes an 8 inch square tin around 30 small squares. Recipe easily doubles. 1. Line a 8 inch square tin with two layers of clingfilm, leaving excess hanging over the sides (see picture below). Break up the biscuits into rough 1/4 inch pieces, chop large prunes into 3 pieces each or halves if smaller. Put into a bowl with the mini marshmallows. If you dont hav mini marshmallows chop up your marshmallows into 2 pieces. 2. Put the chopped chocolates and butter into a large, microwave-safe bowl and heat for 30sec bursts until melted and smooth. Stir in the golden syrup. 3. Add the Marshmallows, Prunes and Short Bread Biscuits/ Rich Tea Biscuits to the chocolate mixture and carefully mix. 4. Spoon the mixture into the prepared tin, scatter over the mini eggs and freeze for 2hr or chill in the fridge until set (about 4-5 hrs). Remove from the fridge 20min before cutting. Cut into small squares. Serve. Store leftovers if any, in the fridge for upto a week in an airtight container. Sounds great Carol. Yummy dessert with less hassle.I have to try this one.... Mouthwatering pictures!!!! Ulka...thanks ...its truly yummy....do try it out.